NEWARK, Del. 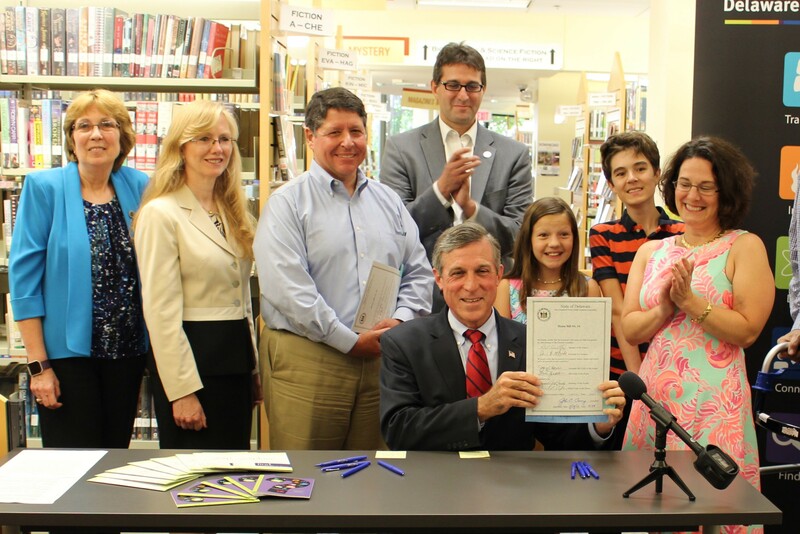 – Governor John Carney on Wednesday signed into law House Bill 94 and House Bill 34, legislation that will allow Delaware libraries to further their efforts to coordinate technology resources statewide and offer more educational opportunities to library and archives professionals. The two measures signed into law Wednesday at the Newark Free Library include House Bill 94, which codifies the state Division of Libraries’ responsibility to administer the Delaware Library Consortium. Launched in 2010, this statewide network of libraries has partnered together to improve the quality and accessibility of technological resources available at libraries. The consortium’s efforts include the development of a statewide digital library catalog and the expansion of high-speed broadband internet access to all public libraries, as well as coordinated purchasing of computer hardware and a centralized tech help desk. House Bill 34, also signed Wednesday, expands the availability of the Ada Leigh Soles Memorial Professional Librarian and Archivist Incentive Scholarship Program to include employees of non-public libraries in Delaware that join the consortium. Established in 2010 as a tribute to the late Newark legislator and tireless advocate for libraries, the Ada Leigh Soles award provides financial assistance to students who work for Delaware libraries and the Delaware Public Archives. Both measures were approved earlier this year by the General Assembly with unanimous support. Newark-area legislators Representative Paul Baumbach and Senator David Sokola led the effort to pass the bills. New Castle County administers the largest network of public libraries in the state and serves as a key partner in the Delaware Library Consortium. The Division of Libraries, which oversees the consortium, is an agency of the Delaware Department of State.